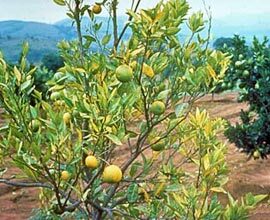 Researchers have been making effort to understand the mechanism of the disease  and to save citrus industry against the horrible disease . However, difficulty in obtaining bacteria culture make it challenging to carry out experiments on C. L. Candidatus. Last year, the complete genome sequence  of C. L. asiaticus was obtained by Yongping Duan and his colleagues and careful analysis of the genome will provide insight into the pathogen and lead to development of methods to control the bacterium. In this website, we build a platform for careful structure and function analysis of the proteome of C. L. asiaticus. For each protein, important information from various sources is gathered and essential features of sequence, such as signal peptide, are predicted. Besides, evolutionarily related protein sequences, families and structures detected by multiple procedures are provided. Abundant knowledge about these related proteins will provide reliable structure prediction and insights about function. With the help of information on the website, manual analysis is carried out to check the consensus between different resources, to make final judgment on the structure and function and to pick up candidates for HLB disease controlling. Updates will be made constantly as proteins are analyzed. Bove JM, Ayres AJ. 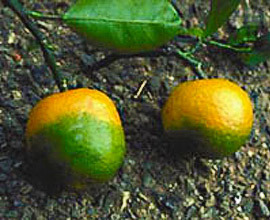 Etiology of three recent diseases of citrus in Sao Paulo State: sudden death, variegated chlorosis and huanglongbing. IUBMB Life. 2007 Apr-May;59(4-5):346-54. Review. PubMed PMID: 17505974. Gottwald TR. Current Epidemiological Understanding of Citrus Huanglongbing. Annu Rev Phytopathol. 2010 Apr 23. [Epub ahead of print] PubMed PMID: 20415578. Kim JS, Sagaram US, Burns JK, Li JL, Wang N. Response of sweet orange (Citrus sinensis) to 'Candidatus Liberibacter asiaticus' infection: microscopy and microarray analyses. Phytopathology. 2009 Jan;99(1):50-7. PubMed PMID: 19055434. Cevallos-Cevallos JM, Rouseff R, Reyes-De-Corcuera JI. Untargeted metabolite analysis of healthy and Huanglongbing-infected orange leaves by CE-DAD. Electrophoresis. 2009 Apr;30(7):1240-7. PubMed PMID: 19283697. Trivedi P, Duan Y, Wang N. Huanglongbing, a systemic disease, restructures the bacterial community associated with citrus roots. Appl Environ Microbiol. 2010 Jun;76(11):3427-36. Epub 2010 Apr 9. PubMed PMID: 20382817. Ding F, Jin S, Hong N, Zhong Y, Cao Q, Yi G, Wang G. Vitrification-cryopreservation, an efficient method for eliminating Candidatus Liberobacter asiaticus, the citrus Huanglongbing pathogen, from in vitro adult shoot tips. Plant Cell Rep. 2008 Feb;27(2):241-50. Epub 2007 Oct 23. PubMed PMID: 17955244. Vahling CM, Duan Y, Lin H. Characterization of an ATP translocase identified in the destructive plant pathogen "Candidatus Liberibacter asiaticus". J Bacteriol. 2010 Feb;192(3):834-40. Epub 2009 Nov 30. PubMed PMID: 19948801. 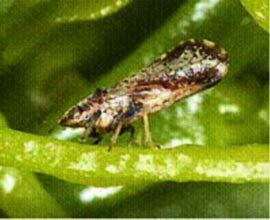 Duan Y, Zhou L, Hall DG, Li W, Doddapaneni H, Lin H, Liu L, Vahling CM, Gabriel DW, Williams KP, Dickerman A, Sun Y, Gottwald T. Complete genome sequence of citrus huanglongbing bacterium, 'Candidatus Liberibacter asiaticus' obtained through metagenomics. Mol Plant Microbe Interact. 2009 Aug;22(8):1011-20. PubMed PMID: 19589076.